It’s a fancy word, but the concept is dead-simple: you mix frequencies to create new ones. The magic of the Theremin is, you use your own body and gesture to control the heterodyning process. Anyone who had trouble moving around while tuning their radio knows something of this effect, but the Theremin makes the process musical. 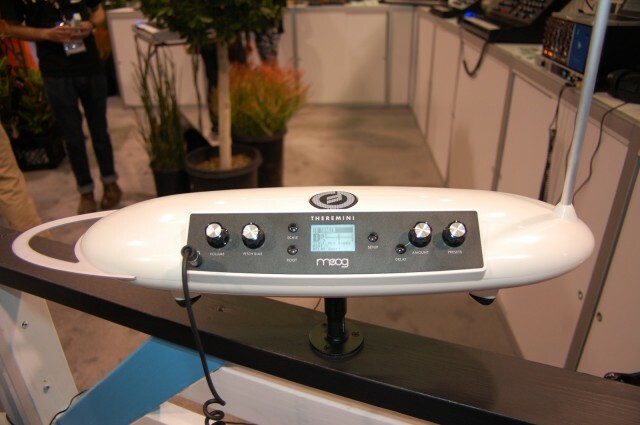 And so, the new Moog Theremini is a thoroughly analog control instrument. What Moog is adding to this control mechanism is a digital sound engine. In simple marketing terms, yes, this means you can crank a knob and never hit a “wrong” note. But in practice, it means more than that. A new sound engine and digital musical applications of the sensitive analog control mechanism unlock new possibilities for sound and playability. Leon Theremin himself applied his circuit to a vast range of imaginative applications. 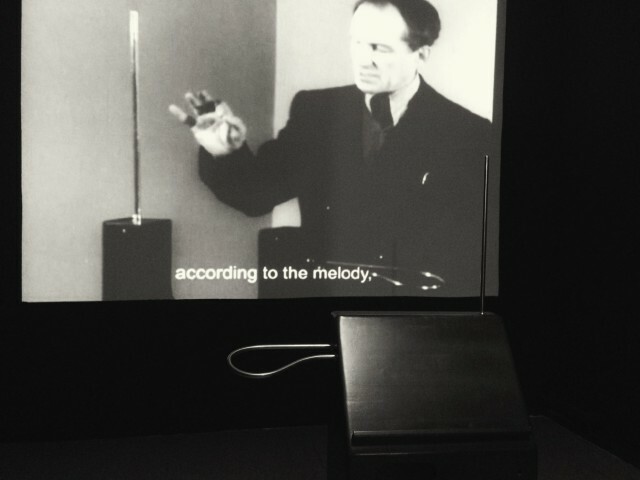 I spent yesterday pondering that with Andrey Smirnov, one of the foremost keepers of Theremin’s legacy, as we toured the exhibit here in Berlin at CTM Festival on the early Russian avant-garde, and let our hacklab participants play with their own Theremin circuit. Andrey emphasized just how broad Theremin’s applications of this deceptively-simple concept had been. And Theremin himself, coming from a background as a cellist, was richly musical in his imagination. To learn more, we spoke again with Moog’s prolific engineer Cyril Lance about how the Theremini works and why. Leon Theremin was constantly reinterpreting the possibilities of what to do with the ingenious circuit in his invention. The pitch frequency is measured extremely precisely from the heterodyned output of the pitch and fixed frequency oscillators. When in fully “continuous” mode (traditional theremin), there is no pitch quantization. When you are fully in quantized mode, the frequency is biased fully towards the root/scale note that it is closest to. If you are playing a C Dorian scale and the frequency is within +/-50 cents of D4, the output pitch will be quantized fully to D4 and there can be no variation from these defined frequencies. The instrument can be biased to any amount between and this is where you can get very musical allowing for microtonal control with a bias towards the selected musical scale. This might be compared similarly to a fretted instrument where a musician approaches a note by bending or a saxophonist adjusts their pitch quantization through their breath-support and embouchure. In fully continuous mode, it would be like a violin where the violinist can choose any microtonal frequency – to be musical on an unfretted instrument such as the violin or traditional theremin requires refined and disciplined technique. Since the theremin is particularly challenging in this regard, the ability for the musician to dynamically choose the amount of pitch quantization creates a more versatile and accessible instrument. When playing the Theremini, the musician will discover that even during the playing of a particular passage, or song, adjusting the amount of quantization allows them to create different ranges of expressivity. There will be CC MIDI output for Pitch and Volume. The Pitch CC output will be scaled to the range of the Pitch Antenna and will also be “post-quantization” – this will allow for CC tracking that is either fully-contiuous, or fully-discreet and anywhere in between which will create some very interesting controller possibilities. Many parameters are also available for modification via MIDI Input. These will allow users to modify the presets and the way the instrument sounds as well as several global setup parameters.. We are not currently announcing an “editor” for the instrument, but customers who use MIDI will be able to access these very easily. An example of this would be how fast the scan-rate is for the wavetable synthesis engine. We’re keen to see this one released. Stay tuned.